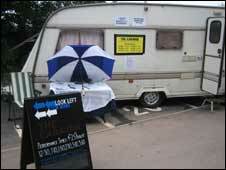 While some families might be spending the summer travelling in a caravan, it is unusual for a play to be performed in one. Fringe show The Caravan is performed entirely in a 21ft caravan, with the actors sitting among the audience. However, as the show's content deals with last year's floods across large swathes of England, it is far from a summer holiday. "The caravan that we're sitting in right now is what we wanted to bring to Edinburgh to tell people the story of the floods," said Liam O'Driscoll, one of those who put the show together. Hundreds in areas such as Hull and Tewkesbury are still not able to return to their homes. In The Caravan, the small group of actors perform verbatim the interviews they conducted with flood victims by sitting among and talking to the small audience all squeezed in the caravan together. This idea of quirky venues and blurring the barrier between the audience and the performers has been growing at the Fringe, with one sketch-comedy even saying they will come to you. However, co-artistic director Ben Freedman said the success of The Caravan was that the content and venue went hand in hand. "We've performed in traditional venues before, but for this show it was to get across how claustrophobic and difficult living in a caravan is," said Freedman. "The venue itself is integral to the actual performance." Audience members were surprised to see the caravan because the promotion for the production does not advertise the odd venue. "I had bought tickets because the content was very interesting. Having the performances in a caravan added tremendously to the impact of the show, it was very powerful and I can't imagine it performed any other way," said once audience member. "When you're that close to somebody it brings a very different perspective to a performance," said Mimi Potskitt, co-artistic director. "It throws all your conceptions of what a normal theatre performance should be." But if the growing number of bizarre venues continues to increase, will the bizarre instead become common? "I think it's good to have a sprinkling of odd venues and performances, as long as it's balanced out," said another audience member. "The unusual venues, those are the things you remember, but I've been to similar shows where the venue was more interesting than the performance's quality." Along with a caravan some of this year's festival includes a bouncy castle, a swimming pool and the zoo.